Modern astronomers are also interested in studying the SMC (and its cousin, the Large Magellanic Cloud), but for very different reasons. Because the SMC is so close and bright, it offers an opportunity to study phenomena that are difficult to examine in more distant galaxies. New Chandra data of the SMC have provided one such discovery: the first detection of X-ray emission from young stars with masses similar to our Sun outside our Milky Way galaxy. The new Chandra observations of these low-mass stars were made of the region known as the “Wing” of the SMC. In this composite image of the Wing the Chandra data is shown in purple, optical data from the Hubble Space Telescope is shown in red, green and blue and infrared data from the Spitzer Space Telescope is shown in red. A paper describing these results was published online and in the March 1, 2013 issue of The Astrophysical Journal. The first author is Lidia Oskinova from the University of Potsdam in Germany and the co-authors are Wei Sun from Nanjing University, China; Chris Evans from the Royal Observatory Edinburgh, UK; Vincent Henault-Brunet from University of Edinburgh, UK; You-Hua Chu from the University of Illinois, Urbana, IL; John Gallagher III from the University of Wisconsin-Madison, Madison, WI; Martin Guerrero from the Instituto de Astrofísica de Andalucía, Spain; Robert Gruendl from the University of Illinois, Urbana, IL; Manuel Gudel from the University of Vienna, Austria; Sergey Silich from the Instituto Nacional de Astrof?sica Optica y Electr´onica, Puebla, Mexico; Yang Chen from Nanjing University, China; Yael Naze from Universite de Liege, Liege, Belgium; Rainer Hainich from the University of Potsdam, Germany, and Jorge Reyes-Iturbide from the Universidade Estadual de Santa Cruz, Ilheus, Brazil. 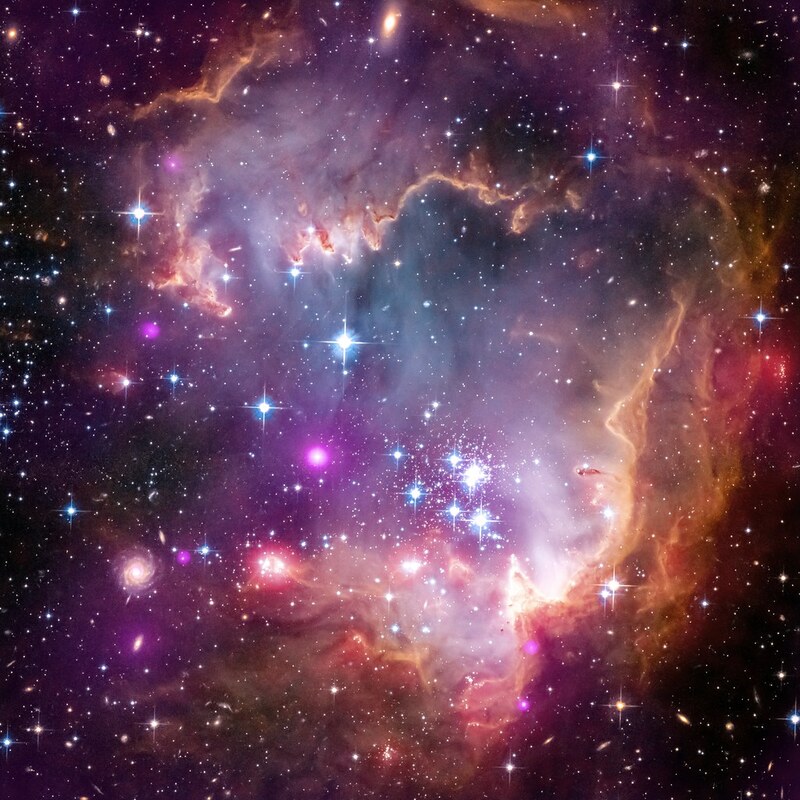 Posted in Artwork, Photography | tagged astronomy, deep space, NASA, NASA Chandler, NASA Marshall Space Flight Center, nature, science, Small Magellanic Cloud, space. The permalink.